Pick of the Week: Token Tower– Fun, motivating, and reinforcing! 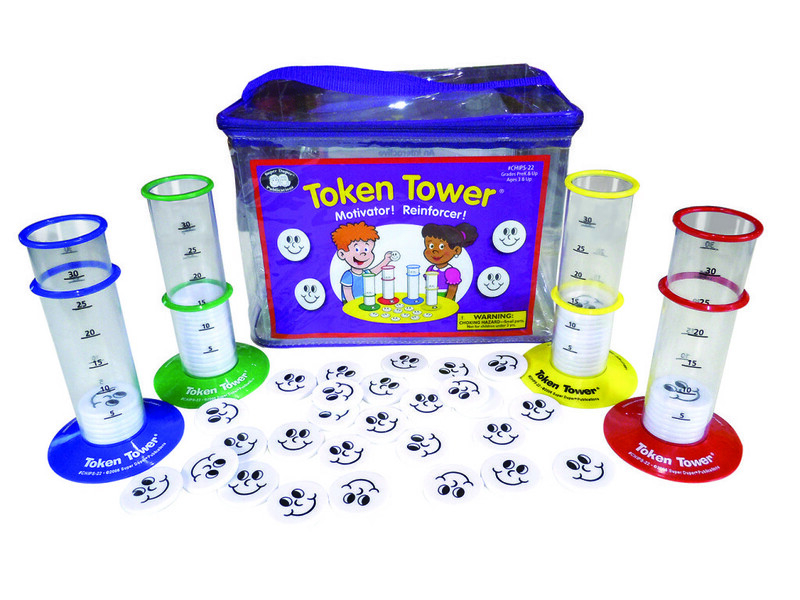 Keep students motivated and focused with these fun, noise-making Token Towers! Set goals using the colored ring and insert tokens as reinforcement for appropriate behaviors or correct responses. The hard plastic chips with smiley faces make a fun noise as they drop into the containers, which is almost as fun as watching the tokens pile up! This week, save 15%* on your set of the Token Towers by applying our promo code TOWERS at check-out. The set includes four Token Towers – in colors red, yellow, green, and blue – and 140 tokens (35 for each tower). Each Token Tower has target goal levels of 5, 10, 15, 20, 25, and 30, and can hold a maximum of 35 tokens. The towers measure 6½ inches tall, with tokens measuring 1½ inches in diameter. *Offer expires on March 15, 2016 at 11:59pm EST. Be sure there are no spaces or dashes in your code TOWERS at check-out. Call our friendly customer service team at (800) 853-1057 with any inquiries. Written by: Different Roads to Learning on March 8, 2016. This entry was posted in ABA, Academics, Applied Behavior Analysis, autism, Development, Difflearn Promo Code, Pick of the Week, Products, Reinforcement, Sale and tagged ABA, Applied Behavior Analysis, autism, autism education, autistic spectrum disorder, behavior management, developmental delays, developmental disabilities, learning, motivating learners, noisemakers, reinforcement, teaching tools, Token Boards and Reinforcers, Token Economy, Token Towers by Different Roads to Learning. Bookmark the permalink.